Arch 2 Line Address Plaque - - The Cape Charles Personalized Address Sign displays your house number and street name along with an emblem accent. Wall mount. 15"W x 9.5"H. Made in USA. With its stretched-out arch shape and minimalist emblem, this address sign has universal curb appeal. Line 1 with house number holds up to five (5) extra large 4.5" numbers for excellent visibility. Colors: BG black/gold, GG dark green/gold, AB antique brass, RG red/gold, BS black/silver, WG white/gold, BW black/white, OG bronze/gold, PS pewter/silver, OB oil rubbed bronze. Large image shown in antique copper. Smaller images (from left to right): black/gold, dark green, antique brass, red, black/silver, white, black/white, bronze/gold, pewter, oil rubbed bronze. 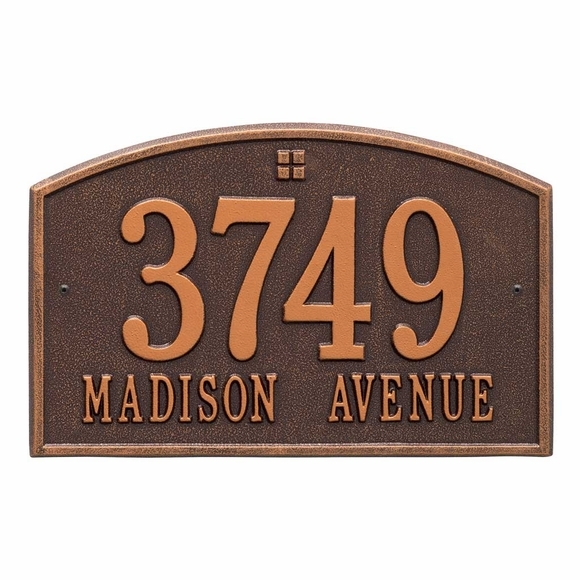 Personalized address sign includes house number and street name.